Trolling is an excellent method of fishing for its ability to cover water, and get your bait down into the strike zone. But sometimes it is not easy to keep your boat moving at the right speed. It could be a strong wind, current, or your outboard causing your bait to move too fast for the fish. There are solutions for this, like drift socks and troll plates. Managing multiple drift socks can be a real pain to deal with, so many anglers look to add the best trolling plate for their outboard to slow their drifts and trolling. The focus of this article is on choosing the right trolling plate for your boat so you can slow down and get your bait into the strike zone. 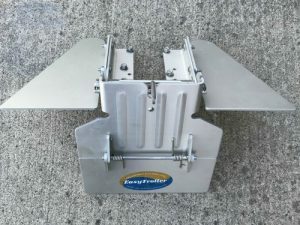 Ironwood EasyTroller – Best trolling plate for the money thanks to sturdy aluminum design with unique pressure relief plate. Davis Happy Troller – A fixed plate design that simply works, both in fresh and saltwater environments. Nauticus Smart Tabs ProTroller – Trim tab and trolling plates combined into one product, and does not interfere with the prop or motor. Trol-a-Matic Trolling Plate – An affordable trolling plate with fully automatic operation. Easy to install, and the best value. 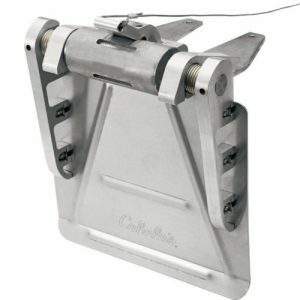 Davis Lil Fella – Best trolling plate for small outboards, 25hp or less. Cabela’s Troll ‘n Go – Premium design and performance, but comes with a higher price tag. A trolling plate is easy to install onto your outboard or inboard. It just takes a few bolts onto the cavitation plate for most models, while some attach directly to the transom. 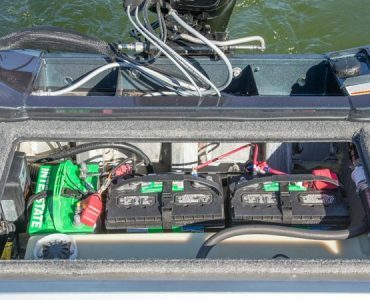 Adding a trolling plate to your outboard does a couple helpful things for both fishing and boating. 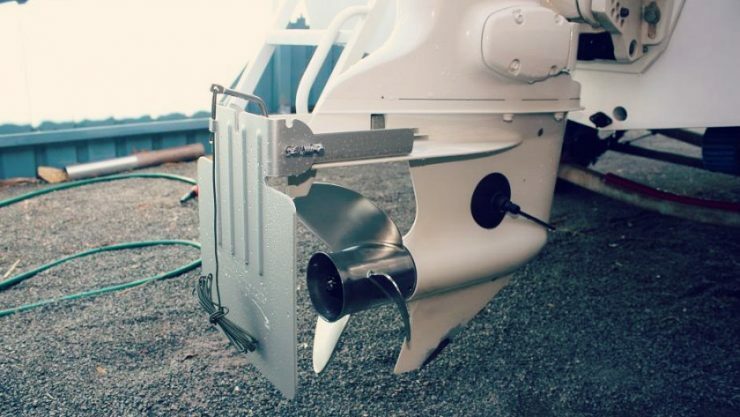 Big Motor Brake – It acts as a brake on the big motor while idling, allowing you to slow your trolling speeds way down. With the plate in the down position, it counteracts some of the thrust from the prop, slowing the boat speed. You can even troll at a good speed going with the wind. Without it, you might be forced to go into the wind only or drag 3 or 4 troll bags behind you. On Plane Control – In the up position, a trolling plate with fins acts a hydrofoil, allowing your boat to remain on plane at slower speeds. It can also reduce the amount the bow slaps up and down on the water at lower speeds, also known as the porpoising effect. Some will say why not just use a kicker motor for trolling. Not all boats come with a kicker, and they aren’t exactly cheap. Kicker motors are just another thing on the boat to maintain, where the trolling plate is installed just once. Sometimes a kicker motor can’t keep up with the wind and waves, forcing you to use the big motor. In that situation, you would still want a trolling plate to slow your speed. Horsepower Rating: Be sure to match the size of the plate with the horsepower of your motor. An undersized plate will not give you the results you want, and an oversized plate on a small outboard will make trolling too difficult. 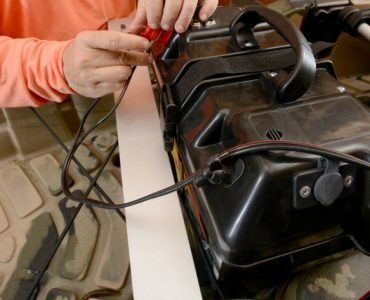 Automatic Deployment: Some plates have a mechanism to deploy and retract the plate, but there is some risk of damage to the plate and the motor if you forget and leave it down while taking off. The best option is the spring-loaded models that automatically lift up under the pressure of the boat getting up on plane. Trolling Plate with Fins: Some plates, like the EasyTroller, have built-in hydrofoil fins to get your boat on plane faster, with even more stability while driving on plane at slower speeds. They are removable with a few nuts and bolts for whenever you don’t need them. Pros: Built from sturdy aluminum plates, features a spring-loaded safety flap and an easy pull retraction mechanism. Available in two sizes, one for small outboards 30-50HP, and the standard size for 50-300HP. The only trolling plate with fins option. Cons: The rope attachment is not the sturdiest and can eventually wear out with use, but can be replaced with a stronger cord. 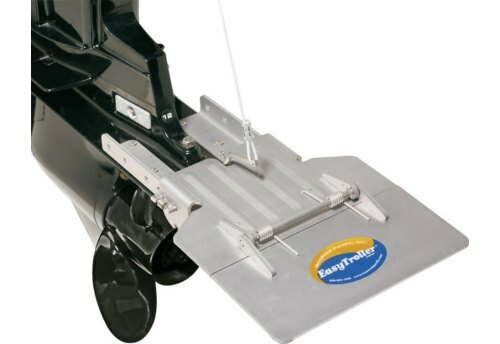 The EasyTroller is an anodized aluminum trolling plate, with stainless hardware, that mounts onto the cavitation plate of both outboards an I/O motors. It features a mechanism that releases the plate into the down position for trolling, then locks in the up position for high speeds, all with a pull of the rope and latch mechanism. What if you forget to pull up the plate before you take off? The EasyToller has a patented break-away potion that relieves the pressure before the plate can be damaged. When the water pressure builds to a certain point, the spring gives way to prevent damage to the unit. 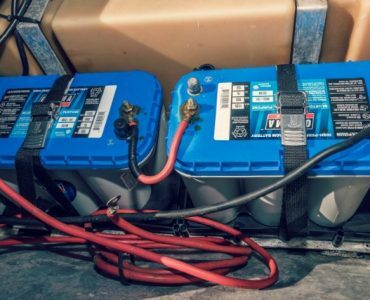 The system works well and is effective at slowing idle speeds of most boats down to 1 mph in some cases. It works equally well in both freshwater and saltwater applications. If you struggle to troll at the right speeds to catch fish, the EasyTroller could be the difference maker. Pros: Another aluminum trolling plate that is effective and easy to use and comes at a lower price. Cons: Lacks the pressure relief plate of the more expensive (and top pick) EasyTroller. The Happy Troller looks almost identical to the EasyTroller, but for one important difference. Both are anodized marine grade aluminum, but the Happy Troller plate lacks the spring-loaded breakaway plate that can save your plate from bending damage. But, you do save a good chunk of coin by getting this fixed plate model. The Happy Troller comes in two sizes, one for motors 50HP and larger, and another for motors between 30 and 50HP. The surface area is the same as the EasyTroller, so it’s equally effective at slowing boat speed. If you can devise a method of always remembering to pull up the plate, this model is a good savings over others. Pros: Dual purpose trim tab/troll plates that accomplish both slowing boats for trolling and dramatically improving holeshots. 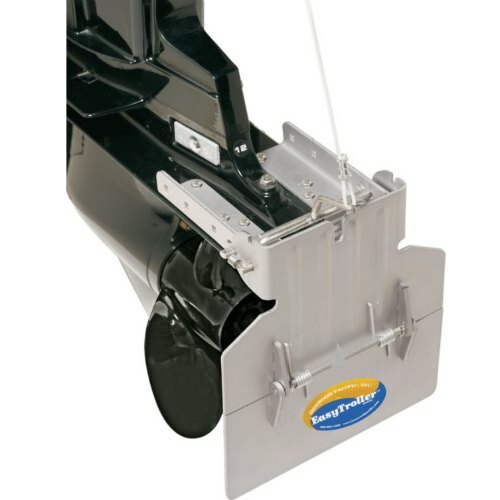 Plowing and porpoising problems are solved with Smart Tabs ProTroller. Cons: Installation requires drilling holes into the transom of the boat. Follow the install guides and use lots of marine sealant and it’s no problem. The ProTroller Smart Tabs are tough, molded composite plastic plates that hinge on nitrogen gas pistons. 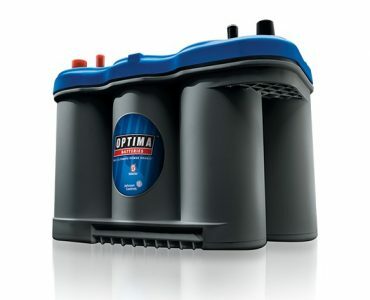 The pistons are designed to compress at certain water pressure levels, depending on the size of Smart Tabs installed on your boat. There are two sizes to choose from, covering a range of hull lengths and motor sizes. If you want a trolling plate that also functions as trim tabs to improve your hole shot and on plane handling, the Smart Tab ProTroller series could solve both problems at the same time. The great thing about them is there is nothing to deploy or forget to retract, it’s all automatic once installed. Unlike cavitation mounted plates, there is nothing impeding the prop or thrust when using Smart Tabs. You mount the pair to each side of the engine, leaving the prop and prop wash uninhibited. A side benefit is not throwing a bunch of prop wash down to interfere with the transducer signal. Pros: A simple and effective design that requires no intervention by the boater. It stays down at idle and automatically lifts on takeoff. The black looks great on black motors. Cons: The plate cannot be raised unless you modify the plate to add a lift cable. Most users say you only lose a little turning ability and doesn’t impede the ability to dock or trailer the boat. The Trol-a-Matic trolling plate is a very popular model because it’s affordable, is spring loaded in the down position, and is made from black composite plastic that matches many outboard motors. It’s about the same surface area as our top pick EasyTroller, but at a fraction of the cost. Installation is much like the other models, requiring you to drill 4 bolt holes in the cavitation plate for mounting. Take note that the Trol-a-Matic does not work with Volo outboards due to their different lower unit layout. Operating the plate is automatic, with no cords to remember (or forget) to pull before running to the next fishing spot. Once you hit the throttle, the water pressure overcomes the springs and the unit becomes a hydrofoil, improving on plane handling at low speeds. Pros: A smaller version of the Happy Troller, this is one of the best and only trolling plates for small outboards up to 25 HP. Cons: Does not improve on plane times as much as a regular trim tab device would, but on 25hp boats that is not as much a concern. The Lil Fella trolling plate is perfect for a small fishing boat with outboard up to 25HP. It’s made of quality aluminum and polycarbonate, with stainless steel hardware, making it usable in fresh and saltwater with no problems. Installation is easy, just attach the control arm to the cavitation plate, using the supplied hardware. From there the backplate attaches to the hinge via locking bar springs and a control cord. The cord is on the small side, you may want to upgrade to a high-quality paracord or cable. Pros: Fully automatic operation thanks to a spring-loaded cam deploy mechanism. Has the ability to add-on hydrofoil fins later. Cons: Expensive compared to the other options. The Troll-N-Go is a fantastic product with a robust design. The components are made of beefy aluminum plates and stainless steel hardware and has been cycle tested to 12,000 cycles showing little sign of wear. Compare the ruggedness of the EasyTroller, and the Troll-N-Go wins easily. You do pay a premium for this plate, but it can be well worth it if price is not a factor.